There are usually one or more warning symptoms that a tooth nerve is dying. Knowing these symptoms can aid in getting dental treatment quicker. Speedier treatment for nerve death can mean the difference in saving or losing the tooth. The root pulp of a tooth can become damaged through a cracked tooth, decay of a large filling, Bruxism, or trauma to the jaw. Gum disease can also play a role in nerve death. As gums recede they can leave a portion of a tooth exposed that has no protection from bacteria and decay. If the patient has a crown on a tooth which has not had root canal treatment, it is possible for receding gums to cause nerve death in the tooth. Usually the first symptom to appear is heat or cold sensitivity. This often occurs with a cracked tooth. This sensitivity may be intermittent or constant depending on the severity of the fracture. I discovered during my years of working in the field of dentistry that a lot of people do not realize how common it is for a tooth to fracture. A tooth most often cracks at the base corner of a large filling. The crack can be hairline or the tooth can fracture enough that the person loses a piece of the tooth, along with pieces of filling. It most often occurs while eating due to the force of the bite during chewing. If the person loses a chip of tooth and pieces of filling, the tooth usually immediately becomes sensitive to heat and cold. If the tooth only sustains a hairline fracture it may be some time before the tooth develops sensitivity. A tooth fracture opens a small amount under the force of biting, allowing fluid filled with bacteria to enter the tooth. 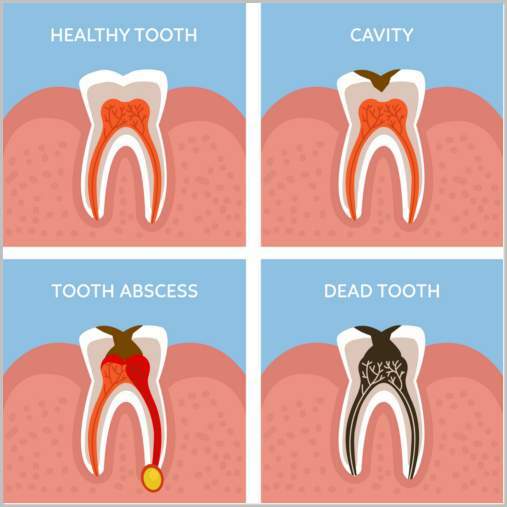 Tooth decay from bacteria reaching the pulp of the tooth occurs. When the decay reaches the nerve pulp the tooth usually becomes heat and cold sensitive. If the fracture occurs slowly over time, the tooth can become mildly sensitive to heat and cold and the person not realize the tooth is fractured. Pain can occur from the pressure of biting down during normal daily activity or through the force of chewing. Pain usually occurs after the nerve pulp damage has reached the tip of the root and infected the jaw bone. Often there is an abscess involved at this point. A pocket filled with pus may be attached to the tip of the root. Pain usually starts out as mild discomfort. If ignored until a pocket of pus forms, the pain can become very intense and the person feel a throbbing sensation emanating from the damaged tooth. This is due to increased blood flow in the inflamed area. Facial swelling can occur with an abscessed tooth. A boil may appear on the gum at the base of the tooth. Swelling can occur with or without the presence of a boil. Swelling usually indicates the infection has progressed into the jaw bone. Any time you experience heat or cold sensitivity or pain you should see a dentist as soon as possible. The dentist will examine the tooth and take x-rays to check the damage beneath the gum. At this point, there is a good chance the dentist can save the tooth through prescribing a course of antibiotics and a root canal treatment. The root canal treatment will need to be followed by placement of a crown on the tooth. If these signs are ignored, by the time the tooth has abscessed enough that a pocket of pus has formed the tooth may not be able to be saved. Swelling can be very dangerous. The infection can spread to the blood stream. Since the jaw bone and teeth are located in the head in close proximity to the brain, infection in the blood stream can be deadly. Follow good oral hygiene habits of brushing and flossing your teeth regularly and keep all routine dental visits. Be alert to the warning symptoms of tooth nerve death and seek treatment immediately should a symptom occur.